Chances are, if you have a business, you have a website. But what happens if somebody interacts with your website? Filling out a form, visiting multiple service pages, requesting an appointment or quote, downloading a resource, or even just signing up for your newsletter. Do people get a thank you response? How about a follow-up email campaign? And do you have proper staff notifications? How much of this happens manually vs. automatically? 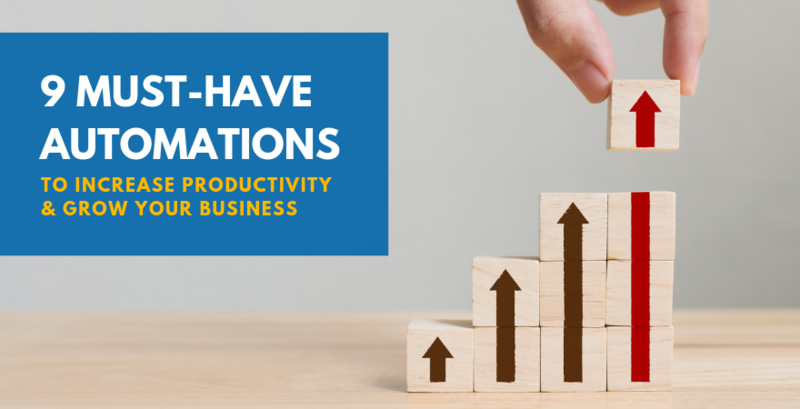 In this blog post, we’ll review 9 must-have automations to help your business save time and increase productivity. Let's start with how to identify which automations would work best for your business. First, look at what's repeatable. Are you constantly sending out the same emails, repeating tasks in your sales process or even in your delivery? Where is there potential for an automated process? If you’re stuck, below are 9 things to get you started. Hopefully, all of your website forms have email auto-responders that go to the customer after they fill out your website form as well as staff notifications. If you don't have that, get it done. Missing this crucial step will make your prospect or customer feel as though their information has been lost in cyberspace. But what else happens? Better yet, what else can happen? All of this and more are possible with automation. If you aren't already familiar with lead scoring, it's a feature within marketing automation platforms that allow you to score the engagement rate of your contacts. By setting up lead scoring rules, you can decide which actions get certain points. For example, clicking on a link in an email might score someone 5 points, while filling out a website form would score them 20. This empowers your sales team to interact with the hottest leads first, and stop wasting time on people who aren't interacting at all. Depending on the marketing automation platform that you use, you can gauge different activities. But most of the time, you'll be able to track email opens and clicks, certain website page visits, conversions such as form submissions, and much more. You can even increase a contact’s score based on their location or job title. The biggest benefit of this, however, is that you'd be able to set up staff notifications if a contact reaches a certain lead score level. They wouldn't have to waste time constantly checking who's at the top of the list, because the contact information would be sent to them upon reaching a high lead score. Do you have a repeating service like dentist appointments, site visits or even reminders like checkups at an optometrist? You should have an automation (or several automations) set up to help your team send out these reminders, automatically. If your contact list is full of people that aren’t engaging with the content you’re sending them, your email deliverability rate is probably being negatively affected. That means, if your content is consistently uninteresting to people, it’s less likely to be delivered to their inbox rather than their spam folder. If you’re already emailing people and this is the case, the first step is to improve your content. If you’re already emailing people and just have a handful of unengaged contacts, it’s a good idea to set up a re-engagement automation. This type of automation typically has content that is very forward. It asks the contact to resubscribe to your list, possibly gives them an offer (something free, but of value to them), and at the end of the series if the contact still doesn’t engage, will automatically unsubscribe them from your list. This can all be automated based on the amount of time it’s been since the contact has engaged. Let your list clean itself! If you were asked to identify which of your contacts are the most engaged with your website and in which content, would you be able to easily answer? If you answered no, you need automated list segmentation.Segmentation within automation gives you the opportunity to see who’s most engaged with your online content. With the power of being able to see what content they’re interested in, automations can be triggered to send them related content. These days, people are doing more research than ever before they even think about contacting you. Provide them with the information they’re looking for up front, and you’re more likely to hear from them first. To piggyback on segmenting by interest is the ability to notify your sales team of contact behavior. Did one of your contacts visit a pricing page one or more times? Let’s trigger a notification to a sales team member to give them a call. What kind of time would that save you? How much better of a conversation could you have with leads? How many tire kickers could you weed out, sooner? If someone signs up for your newsletter, they’re obviously interested in your products or services, but most likely aren’t ready to contact you yet. So don’t rush to connect immediately with these people. Instead, let automation do the work for you. If you’ve already got a list of people but have no idea what they’re interested in, try sending out a content survey - something similar to the email in #6 above. This is something that you can automate to go out every once in a while to keep your list fresh. And these days, people WANT to only get the information they’re interested in. So show them you’re paying attention, listening and taking action. All automatically, of course! Someone signs up for your service or purchases a product. What happens next? What’s their experience like? If you’re not sure - you might want to take a few steps back and document your process. If you DO know your process, which steps happen the same exact way every single time? Do they get an onboarding email that can be automatically sent out? Is a particular person notified on your team? Do they get added to a certain email funnel? Are they offered related services or products? Are they sent training videos? Now that you've been servicing customers and they're happy, it's time to ask them for some feedback or even referrals. But we don't want to do this manually. Automation allows us to send out a request for feedback and/or referrals automatically based on the amount of time that they have been a customer. For example, if you’re a dental office, you may want to send out a day of notification asking your customer how their experience was. On the other hand, if your service or product requires some time for the customer to experience it, you might want to wait a week or so until you ask. Imagine how automating this process would enable you to not only get more online reviews, but also better insight into your services. If you receive a low rating, trigger an alert to your team to respond immediately and fix the issue. For high ratings, send them to your team to boost morale. If one, two, or even all of these automations sound like something you need, it’s time to take the plunge and automate your business. At Friday Marketing Inc, we’re all about automation. In fact, we automate as much as possible for ourselves. So you could say, we’re walkin’ the walk… taking our own medicine… you get the point. And it’s not just to prove a point—it’s because it works! If you’d like to hear about automation potentials for your business, schedule a call with us by clicking the button below. We look forward to getting your business to the next level through automation.